In the lead-up to the sixth season, Netflix revealed that Orange Is The New Black was getting a change in location, with the social media accounts posting a new version of the opening credit sequence that now includes an image of the cells “down the hill” in Max. When I saw those posts, I found the whole thing kind of comic: the tweet promised an “updated” title sequence but didn’t change anything but a couple of background images, adjusting neither the song that some people hate nor the close-up images of inmates that others despise. All they did was trade one prison for another, which hardly seemed like a significant change. But watching the season premiere, “Who Knows Better Than I,” I realized why Netflix might have oversold this particular development. We’ve heard about Max since the series began—it’s where Claudette was sent, never to return, in the first season—and we’ve visited it when Nicky and then Sophia were sent down the hill. But this is not one inmate being sent away for an infraction: this is a group of ten women, sent to max for their role in the riots, with no idea if or when they’re ever going to return to the “normal” life behind bars they knew before everything went to hell at Litchfield. That statement feels wrong: the show’s central thesis since the first season was that Litchfield was a form of hell, whether because of abusive guards or the corporatized private prison system or any number of ways that the prison-industrial complex has robbed these women of the opportunity to rehabilitate. And yet it’s clear that something changed when Poussey died, an event that happened less than two weeks ago within the world of the show despite having taken place over two years ago for us at home. That injustice was different, and led to the riots, which dramatically changed the pacing of the show but ultimately didn’t change much else about it—in retrospect, the riots were a form of stasis, freezing that space and those characters in a moment of uncertainty, acknowledging with the cliffhanger that the real change was going to come with whatever happened next. 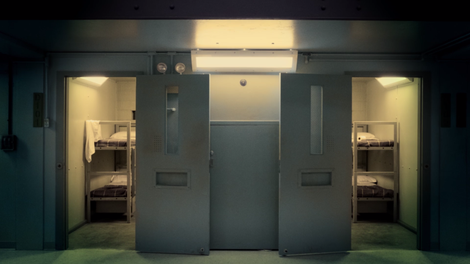 The change of Max is felt immediately, and not simply because the writers chose to have us experience the change through the inmate least equipped to handle it. The choice to focus on Suzanne was not solely driven by the inspired fantasy sequence that opens the episode, with Suzanne imagining television shows featuring her fellow inmates. It’s a clever way to remind us where each character left off emotionally while simultaneously establishing that Suzanne is not well, and when the show jerks back to reality we realize that no one is: Freida has attempted suicide, Daya is recovering from the latest in a series of beatings, and no one has any idea what is about to happen to them. Suzanne is the first to be questioned about the riots, it would appear, but she is not the last, and what she witnessed with Cindy* in the aftermath of the guards storming Litchfield gives us every reason to think that the worst is still yet to come. * Style note: I’m dropping the Black from Black Cindy, even if the subtitles and marketing don’t. It’s time. Suzanne’s reaction to this is more extreme than the others: she’s off her medical routine, and struggling to keep a grip on reality. That means the show gets to play with comedy, as Suzanne imagines Lolly and the rest of the inmates in Psych doing the Cha-Cha Slide, but what we’re witnessing is a woman hallucinating her mother as a defense mechanism, her brain desperately pushing her to do what she needs to go in order to avoid being sent to Psych permanently. And she’s doing so while being forced to testify by an investigator ignoring her tenuous grasp on reality, and while carrying three different stories—the truth of what happened, the lie that the guards constructed using Piscatella’s corpse, the lie that Red wants the women to agree on—at a time when she can’t even keep reality straight. Her “reward” for managing to survive this ordeal is being the first of the women to be introduced into General Population, but what she finds there as the episode concludes is not “home.” It is a new sort of hell, one defined by a base level of mistreatment and dehumanization that we once saw as the exception to the norm at Litchfield proper. Nothing that we see happen to the women here is near the worst of what we’ve seen done by guards over the course of the series, but there is something different when it’s just “what happens”: Daya is beaten every day because of her role in Humphrey’s death, and no one bats an eyelash when Taystee is attacked simply for the fact she had no one to call. The flashbacks here primarily exist to reveal that the guards are framing the women in the pool for Piscatella’s death, but the most striking moment was Frieda on the bus, terrified at the idea of going back to Max, already planning to commit suicide rather than end up there for the rest of her life. While it’s tough to watch Gloria and Maria hosed down and then forced to kiss one another, it’s more terrifying that we can’t chalk this up to a particularly sadistic guard or a lack of training as we often did in previous seasons. This is just how Max is, and it contributes to a premiere that never comes close to getting the show back to its regular rhythms. That’s not a bad thing in a premiere: it reminds me of season two, which also picked up after a cliffhanger, but that time solely focused on Piper’s trip to Chicago. Piper’s singular focus on Alex here is a byproduct of the uncertainty of the situation, but there are all sorts of characters who aren’t accounted for (although a quick scan of the opening credits provides clues for viewers, not that Piper has access to that information). Will we see what happened to the inmates who weren’t a part of the last standoff in the riot, or who took on a less active role in general? Will we see the aftermath outside of the prison? The premiere lives in the heads of these women still trying to get their stories straight, but it’s still unclear what stories Orange Is The New Black wants to tell. And as with season two, the streaming distribution model gives the show the ability to isolate itself like this in a premiere, knowing that most users who are confused about what lies ahead can just let auto-play take them to the next episode, which could—as far as we know—focus entirely on every other character and leave this group behind entirely. But that doesn’t feel likely, does it? I tried to think of any of the characters who didn’t make it to Max outside of Alex that have any significant story to be told, and I couldn’t really think of any: you could tell more stories about those characters, absolutely, but the main tensions of the riot are represented in this group, and provide more than enough story for thirteen hours of television given the legal and interpersonal dynamics promised by the investigation. Combine with the introduction of new characters in Max like “Badison,” and you have a television show that probably doesn’t need to be bouncing between several prisons. If we leave some characters behind, like we did with Claudette when she went to Max, that’s only supporting the show’s thesis about what happens to these women in the system. And, frankly, it would let the show escape out from under an almost oppressive volume of characters collected over the years, which is hard to do when you’re a show set in a correctional facility. Regardless, however, “Who Knows Better Than I” feels like the change that the beginning of the riot promised, delayed by the choice to tell last season in slow motion. And while none of the oppression captured by the episode is “welcome,” it gets the season off on the right foot thematically. I appreciated the divides of class and race being exposed by the need for legal representation: while Cindy lucks out with the Rabbi’s contact, Gloria is forced to rely on a public defender while Piper’s father and even Nicky’s deadbeat father are able to get their daughters real representation much like Suzanne’s (white) parents. OITNB Dictionary: I feel like the show has never used Ad Seg—Administration Segregation—as a term before? But it’s basically a fancy way to say solitary confinement, but for reasons more likely to be tied to safety or, in this case, legal reasons than just “punishment.” These are different than the other solitary cells we’ve seen at Max. What do you think we should read into the fact that Taystee doesn’t have a show in Suzanne’s fantasy? I wondered if it was to leave us in suspense as to whether Taystee had been sent to Max or somewhere else, but perhaps it might have been as simple as scheduling with Danielle Brooks? I suppose only time will tell. Speaking of Taystee, interesting to give her a guard that she knew growing up: it becomes an interesting conversation about the role luck played in their respective paths from their time working at Storky’s as teenagers. Curious what the show wants to do with those two. I respect when shows anticipate by objections before I can log them, as happened when the guards planting Piscatella’s body in the pool acknowledged they would need a cooperative coroner in order to sell the postmortem gunshot wound as a cause of death. Not going to lie: I didn’t immediately peg Suzanne’s mother as a figment of the imagination because the show’s grip on proper procedure is often sketchy enough that the idea of her mother being in the interrogation didn’t seem too farfetched. I had it figured out once she followed her to Psych, though. Something I didn’t notice on first viewing: the two “guards” in Daya’s modern dance fantasy are actually the actors playing the guards who hose down Gloria and Maria. So what was everyone’s favorite “show” in Suzanne’s fantasy? I think it’s hard to top Nicky as Rowlf for sheer absurdity, but Cindy’s “Secret Agent” song was strong, and I’m a cheap date when it comes to beloved Canadian television personalities swearing so I can’t discount Trebek. Welcome to our episodic coverage of Orange Is The New Black season six! It’s weird to think that I’ve been writing about this show for five years now, but it’s been a long journey, and I’m glad you’ve chosen to join us for at least one more ride. I’ll be dropping into the comments when I can, but with all the reviews posting today, I imagine that the conversation will take place largely on the review of the finale. Still, if you have a specific thought about an individual episode, I encourage you to leave it on that episode’s review.